ECO T962 is a micro-processor controlled reflow oven. The device is powered by standard 110V~240VAC 50/60HZ. User interface is implemented by way of T962 input keys and an LCD display. Pre-Set heating Modes are selected by user interaction with thermal cycle progress observed on LCD display. remove/replace bad components and complete small engineering models or prototypes. micro-computer control with infrared heaters, thermocouple and circulating air. The T962 is simple to use, the soldering process is completely automatic defined by pre-defined thermal cycles. surveillance automatic completed; Can soldering the most smart small part. Adopted a high and dependable design,make what you see gratifying and rest assured. 1. 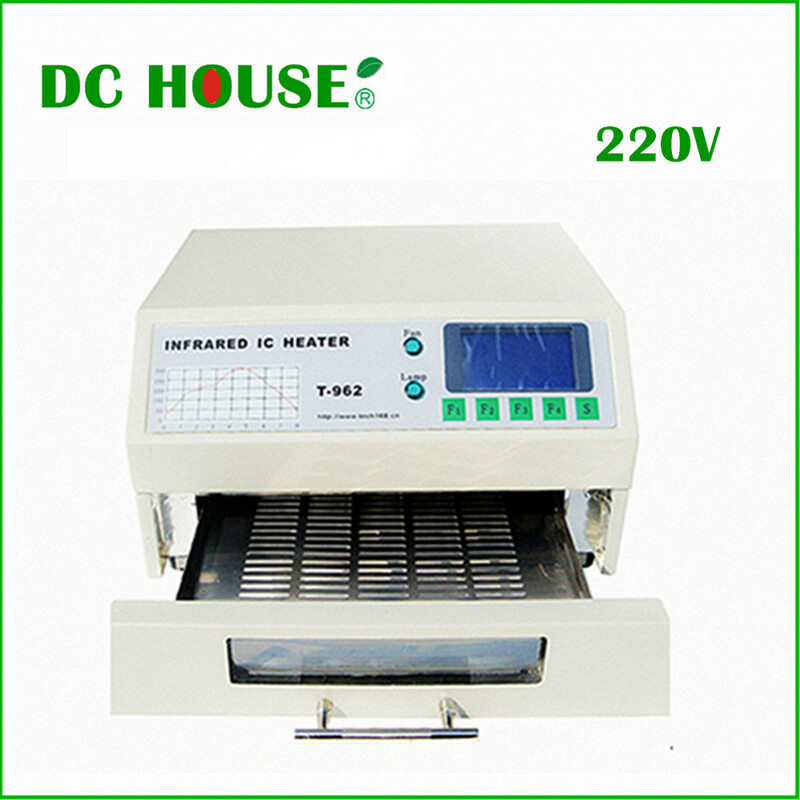 The T962 is a self-contained Micro-Processor controlled IC Heater and solder rework station. 2. Uses up to 800 watts of energy efficient Infrared heating and air circulation to re-flow solder in a large 180×235mm area. 4. Soldering cycles are keypad selected and progress displayed on the T962 LCD. 6. The T962 design is ergonomic, practical and easily operated. 7. The entire soldering process is completes automatically from Preheat, Soak and Reflow through cool- down. 8. The T962 design is ergonomic, practical and easily operated. 9. The T962 is an economical rework solution from single runs to on-demand small batch production. 10. Light weight and a small footprint allows the T962 to be easily bench positioned transported or stored.